We’re happy today to be able to share with you the new cover of Forsaken by the Others, the fifth book of the H&W Investigatigation. Nous sommes très heureuses aujourd’hui de partager avec vous la nouvelle couverture de Forsaken by the Others, le cinquième tome de la série Waynest. 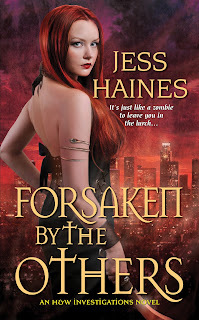 This entry was posted in cover reveal, Jess Haines, Urban Fantasy. Bookmark the permalink. I think I like the French one a bit better, but the top one is pretty too, with the city in the background. Oh I like the French cover!! So need to start this series! yeah you really need to!!! Oh great to hear! And love seeing the French cover as well. 🙂 Thank you for sharing. lol maintenant j’ai la pression. J’ai hate de voir ce que tu en penseras. On aura un petit concours. Thanks for showing the French cover as well, that red hair sure is pretty! I do love this series, but have to read the previous one. Hope to get to it this week. Oh I’ll keep an eye on your review! Je ne connais pas du tout ce roman mais j’aime beaucoup la couverture française ! J’ai hâte de lire cette série. Elle est vraiment super! j’espere que ça te plaira!